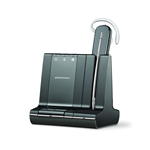 Plantronics CS500 series headsets are ideal for office-based workers who use a traditional desk phone but need hands-free mobility. 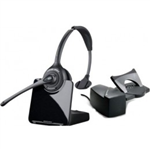 The Savi 400 series headsets are light-weight, DECT headsets for PC-based communications. 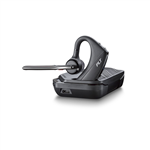 The Plantronics Savi® 700 series connects to all three of your phones, desk, computer and mobile, and is optimized for Unified Communications. 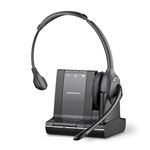 Plantronics Voyager PRO UC headsets connect to both computer and mobile phones and are built for Unified Communications. 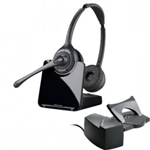 Headsets designed to work with your Cisco IP Phone 7945G and 7942G. The Plantronics Savi 430 is a portable, wireless, PC-based headset that incorporates DECT technology for unsurpassed audio quality, even in dense working environments. Built for UC applications with hands-free functionality increases productivity by enabling users to multitask and move freely around the office. The Plantronics Savi 430 is a portable, wireless, PC-based headset that incorporates DECT technology for unsurpassed audio quality, even in dense working environments. Microsoft optimized with hands-free functionality increases productivity by enabling users to multitask and move freely around the office. 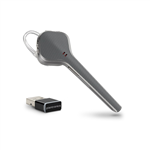 This Plantronics Savi 440 convertible, wireless headset is built for UC applications and softphones from Avaya, Cisco, IBM and more. The Savi 440 is ideal for users in campus-like business environments using a laptop for voice calls and requiring the highest sound quality and portability. This Plantronics Savi 440 convertible, wireless headset is optimized for Microsoft Lync and Microsoft Office Communicator 2007. The Savi 440 is ideal for users in campus-like business environments using a laptop for voice calls and requiring the highest sound quality and portability. The ultimate in mobility and sound quality for hands-free, secure conversations to your phone. The only UC headset you need for everywhere you work. The only UC headset you need for everywhere you work. The Plantronics CS540 wireless headset is convertible with three wearing styles: over-the-ear, over-the-head, and around-the-neck*. 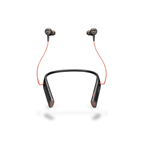 The Plantronics Voyager PRO UC wireless headset can manage both computer and mobile calls and is UC ready. The B230-M is the Microsoft version optimized for Microsoft® Lync™ and Microsoft OCS 2007. 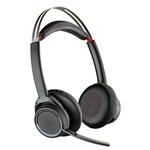 The Plantronics Voyager PRO UC wireless headset can manage both computer and mobile calls and is UC ready. The B230 is the standard UC version built for UC applications and softphones from Avaya, Cisco, IBM and more. Replacement battery or backup battery for the Plantronics CS540 headset. Having a battery you can quickly swap out means never being without your headset when that important phone call comes in. The Plantronics CS510 wirelss headset is an over-the-head headset with a single speaker. The Plantronics CS520 wireless headset is an over-the-head headset with duo speakers. 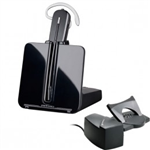 The Savi 710 over-the-head, mono-speaker, wireless headset has three-way connectivity (desk, computer and mobile) and is UC ready. The Savi 720 over-the-head, duo-speaker, wireless headset has three-way connectivity (desk, computer and mobile) and is UC ready. The Savi 730 over-the-ear wireless headset has three-way connectivity (desk, computer and mobile) and is UC ready. The Savi 730-M over-the-ear wireless headset has three-way connectivity (desk, computer and mobile) and is UC ready. It is also optimized for Microsoft Lync 2010 and OCS 2007. 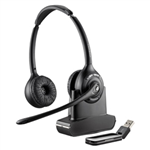 The Savi 740 convertible headset has three-way connectivity (desk, computer and mobile) and is UC ready. 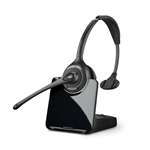 The Savi 740-M convertible headset has three-way connectivity (desk, computer and mobile) and is UC ready. It is also optimized for Microsoft Lync 2010 and OCS 2007. 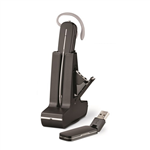 The Savi 745 convertible headset has three-way connectivity (desk, computer and mobile), is UC ready, and comes with a deluxe charging cradle for unlimited talk-time. Triple the number of wireless headsets in the same space without compromise. Triple the number of wireless headsets in the same space without compromise. Plantronics' legendary CS family is setting a new wireless standard for desk phone communication with the CS500 Series. Triple the number of wireless headsets in the same space without compromise. Triple the number of wireless headsets in the same space without compromise. The highest level of wearing style choice and best-in-class PC audio in a convenient, portable package. The highest level of wearing style choice and best-in-class PC audio in a convenient, portable package. The highest level of wearing style choice and best-in-class PC audio in a convenient, portable package. The highest level of wearing style choice and best-in-class PC audio in a convenient, portable package. The highest level of wearing style choice and best-in-class PC audio in a convenient, portable package. The highest level of wearing style choice and best-in-class PC audio in a convenient, portable package. Enjoy wireless freedom while seamlessly managing PC, mobile and desk phone calls with a single intelligent headset system. Enjoy wireless freedom while seamlessly managing PC, mobile and desk phone calls with a single intelligent headset system. Enjoy wireless freedom while seamlessly managing PC, mobile and desk phone calls with a single intelligent headset system. Keep the focus on your conversation, not background noise, with the sophisticated noise canceling and immersive stereo sound of the Plantronics Voyager Focus UC Stereo Bluetooth headset. Be ready to take the call, wherever you’re connected. The Voyager 5200 UC Bluetooth headset offers our most advanced, adaptive noise cancelling with WindSmart technology to reduce disruptive noise. It’s ready to work. With premium features and professional-grade audio, Voyager 6200 UC is a Bluetooth® neckband headset with earbuds that has the versatility to go beyond the office. Transitioning to your next conversation is easy: Connect with colleagues working remotely, listen to music to focus distraction-free or drop an earbud to tune in to the conversation around you. You can count on Voyager 6200 UC for outstanding audio every time, everywhere. The world is your office. But it doesn’t have to look that way. Sleek and discreet, Voyager 3200 UC cancels the noise and keeps the conversation going. Anytime, anywhere. Enjoy intuitive call management and outstanding audio from your mobile phone on the road to your desk phone in the office, and everywhere in between. Enjoy intuitive call management and outstanding audio from your mobile phone on the road to your desk phone in the office, and everywhere in between. Wherever you work, noise can be distracting. So whether you’re in an open office or on a crowded flight, taking calls or listening to music, the boomless Voyager 8200 UC Bluetooth® headset with active noise canceling lets you focus on what’s important, in comfort and style.